This fantasy guide is perfect for that lighthearted adventure where comedy is the relief. This book is set in the fantasy Empire of Banqueria? but could easily be used in any fantasy world. The new race, the Great Southern Rock Troll, makes for the perfect strong man or believable geek. Creatures like the Flying Dobo and Sequinni will bring the locals to your tent. When a circus comes to town it is a celebration for some and a trial for others. Playing members of a tightly bound troupe of peers and friends makes for a strong band and fund play. Sometimes you want to get out and stretch your legs and see what the world has to offer. There is always adventure on the road and as you travel along it, adventure is sure to rise and meet you. 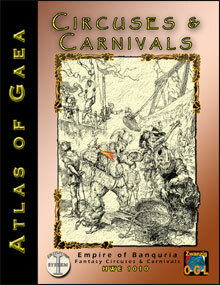 Circuses and Carnivals opens new vistas for the GM and the players with character seeds and adventures seeds for the whole group. Play new classes or your old favorites in situations you never would have expected. Full color maps give you some of the favorite locations like the Golden Forks Inn on the main circus routes, the surrounding area and the Empire of Banqueria. Once at the carnival or circus, there are rules for running the games you will find on the midway.? There is a lot of information stashed in this book. So, next time you are feeling hemmed in, remember, you can always run away with the circus! New Foes including the deadly Sequinni, the fire breathing chicken! Visit the HinterWelt Circuses and Carnivals Site!